When I met up with these two awesome hipsters we clicked INSTANTLY. Even Lily felt that her and I had know each other for years. 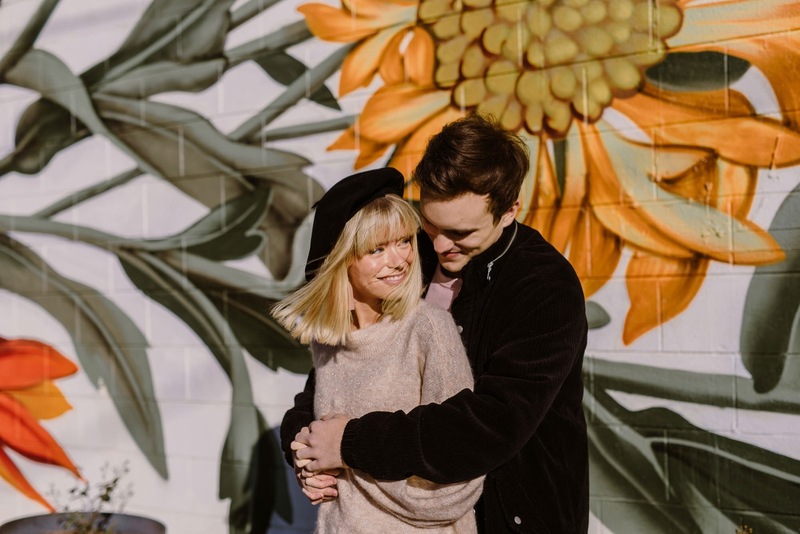 Downtown Raleigh has colored itself with so many gorgeous murals, so when I saw this beautiful flower mural on their social media I was determined to have an engagement session there. For Lily and Devins session the sun was set perfect for the mural and their silliness. Afterwards, Lilly asked if it were ok if we went and grabbed coffee. For those of you that don’t know me very well, I NEVER turn down coffee. We headed a block down the street to Jubala and their adorable new space on the corner of Hillsborough Street. Lilly expressed having pictures of the two of them with coffee was truly “them”. Once we had our pick me up, we headed back out in search for some more sun and murals and found both. What a bombass session! Love these guys!! !